We shall not fail or falter; we shall not weaken or tire… Give us the tools and we will finish the job. 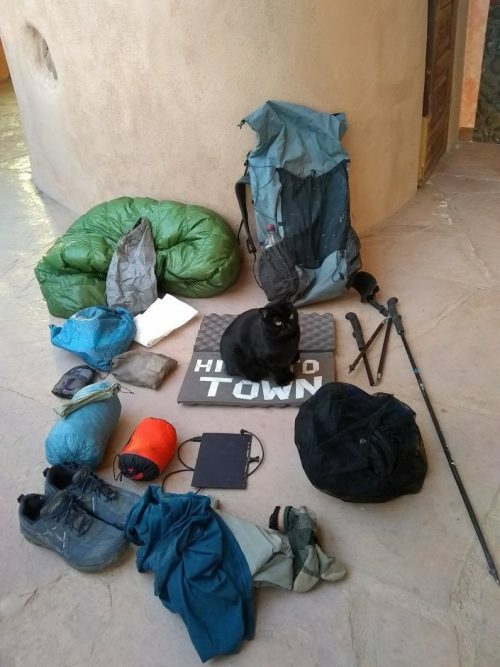 Here is the gear for my 2018 PCT thru-hike. Extended comments about particular items are at the end. 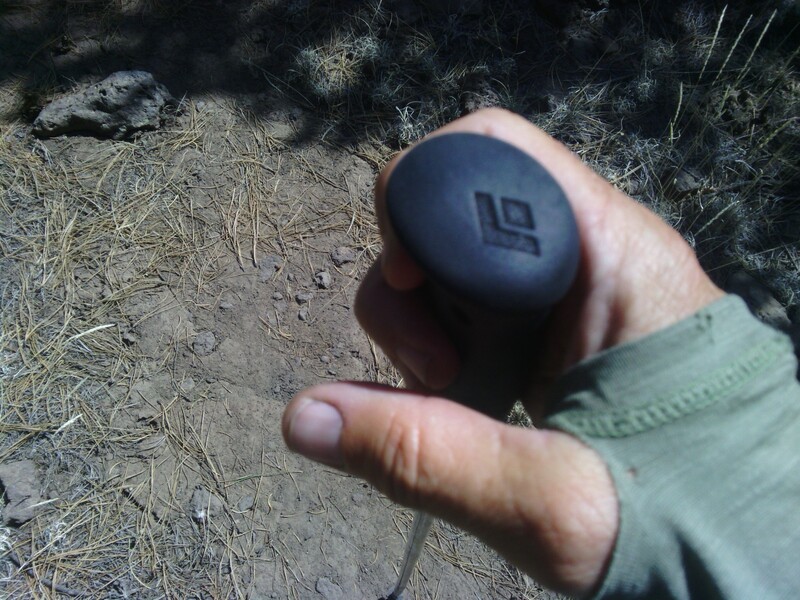 I found a great deal of variation on equipment choices among hikers. Many small gear vendors are in healthy competition, with frequent innovations and design updates. Main blade, nail file with screwdriver tip, scissors, tweezers, and toothpick: the Victorinox Classic SD Swiss Army Knife is a marvel of design in a lightweight form factor respected by long distance hikers. I do not really need the toothpick, though, so can something else go in that slot? 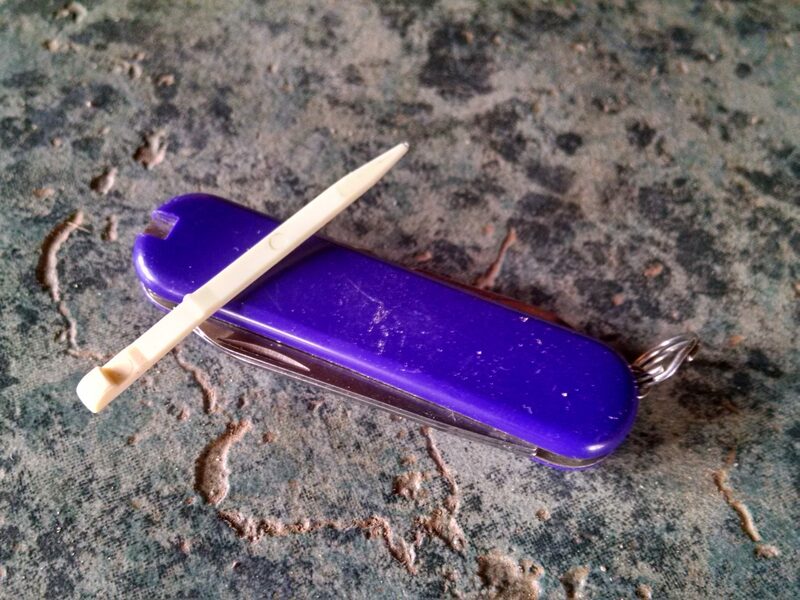 The plastic toothpick is roughly 1.75 inches long x 0.12 inches wide x 0.047 inches thick. FireSteel.com sells blank rods of ferrocerrium in various sizes, including the FireSteel Tiny, 1/8 x 2 inches, at less than US$1.00 per rod. 1/8 inch is close to the width of the toothpick, so we just need to grind down one side flat, grind down most of the opposite side to a thickness of 0.047 inches. We must leave a thick tip at one end as with the plastic toothpick, to allow fingers to remove the gadget from the handle of the knife. Agatha Clay: People keep giving me rings, but I think a small death ray might be more practical. Water is scarce, with 20 miles to next reliable water source not uncommon in southern New Mexico, so a different pack capable of comfortably carrying 5 or 6 liters of water (over 10 pounds) a long distance is needed. The extra water is heavy, so my frameless Mariposa pack will not do. Available water is often turbid, which limits performance of UV water treatment. One of the new lightweight squeeze filters is used this trip. The CDT is often cold, with big drops in nighttime temperatures, so a warmer sleeping bag, sleeping pad, and clothing are desirable. With higher elevation and no “green tunnel”, sun exposure is greater. I decided to hike in long sleeve clothes, sun hat, and sunglasses. 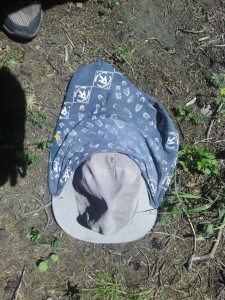 And a wide-brimmed hat is not sufficient to protect my face when hiking all day, so more sun screen is used. Fewer trail towns mean I need a better charging solution for cell phone(gps/camera/mp3 player/ebook reader/journal/audio recorder) and I tried a folding solar panel mounted on top of my pack. An electronic trail journal is now used in place of paper. I needed a better onscreen keyboard to get my typing rate up to an acceptable level. MessagEase is a free substitute keyboard that works for me, but has a really steep learning curve, so I needed to drill on the MessagEase Game every day from January to April before my trip. I might write about other phone apps useful for hiking in another post. The light-weight merino long sleeve shirt worked fine as a camp shirt on the AT, but started wearing out when used as daytime clothing, especially under the pack straps. 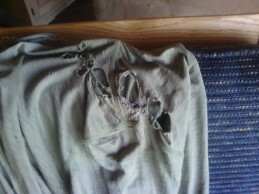 No amount of sewing kit repair could keep the shirt together by the final days of the trip. One week I was running low on sun screen, having left my bottle at the last hotel. To keep my hands from burning I added thumb loops to my long-sleeved shirt. The seams at the wrist just happened to be placed in such a way as to keep my modification from ripping the material. The solar panel with built-in battery pack was not enough to keep up with my cell phone charging requirements, so I also needed the external USB charger pack. I will try a different solar panel next year in hopes of not needing to supplement with my mophie. The solar panel was attached with mini side buckles sewn onto the panel fabric and backpack attachment straps, providing quick release to get access to the top opening of the pack. 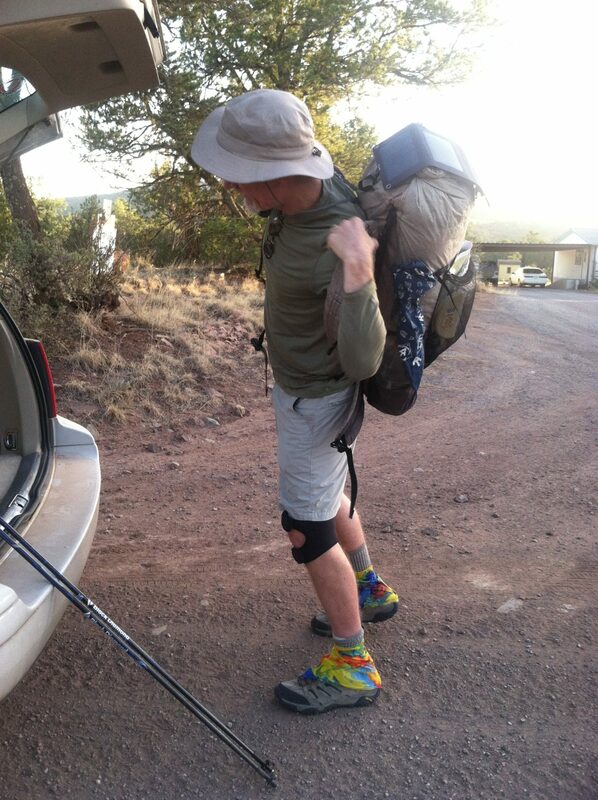 Running gaiters kept small rocks and sand out of my shoes, so I almost never had to stop for a shoe break. The gaiters got pretty torn up by barbed wire fences, so were ready to be replaced by trip’s end at Cumbres Pass. My Helios wide-brimmed hat was not enough to keep my face and neck from burning when hiking all day, especially when the sun was low in the sky. I needed to pin my bandana with safety pins on the brim for more shade. The Caldera cooking system used on the AT performed well, but requires a separate plastic canister for storage. I tried transitioning to a home-made stove/windscreen/pot-support that fits inside my 0.5 liter pot for compact storage and to save weight. Plenty of wind can be expected on the CDT, so a good functioning wind screen is essential for alcohol stoves. I experimented with making several alcohol stove designs, but was not able to improve on the Caldera for cooking time and fuel use when I measured performance, so I stayed with the older equipment. The Sawyer filter worked great, and was similar in weight to a Steripen, so I will keep using. 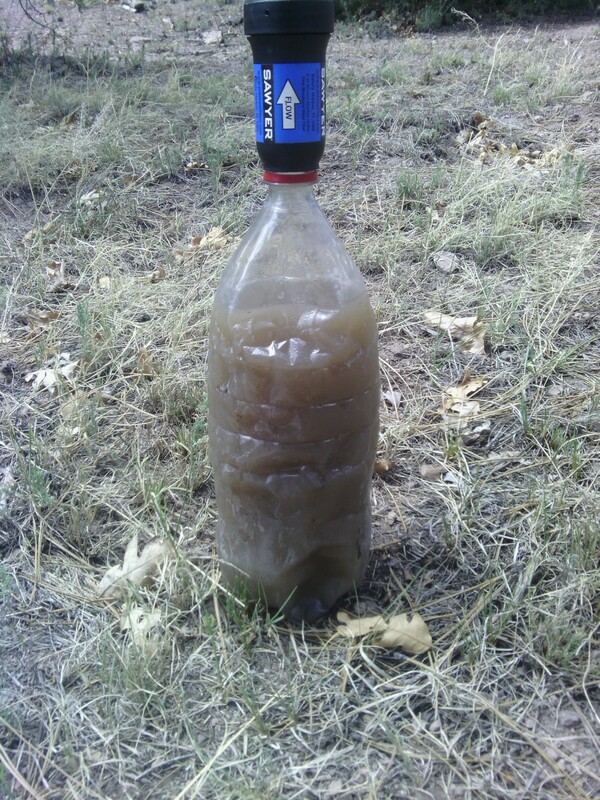 I did include the syringe for backwashing the filter, and certainly needed it for New Mexico. During the day I kept the Sawyer screwed onto one of two 2-liter plastic soda bottles, stored in the lower outer side pockets of the pack. The soda bottles squeezed just as easily as a platypus bottle, and were quite durable and inexpensive. Do not screw on the filter too hard on the bottle threads, or you will chew up the washer and cause leakage during filtering. I am used to hiking in shorts, but switched to long pants this trip for sun protection. 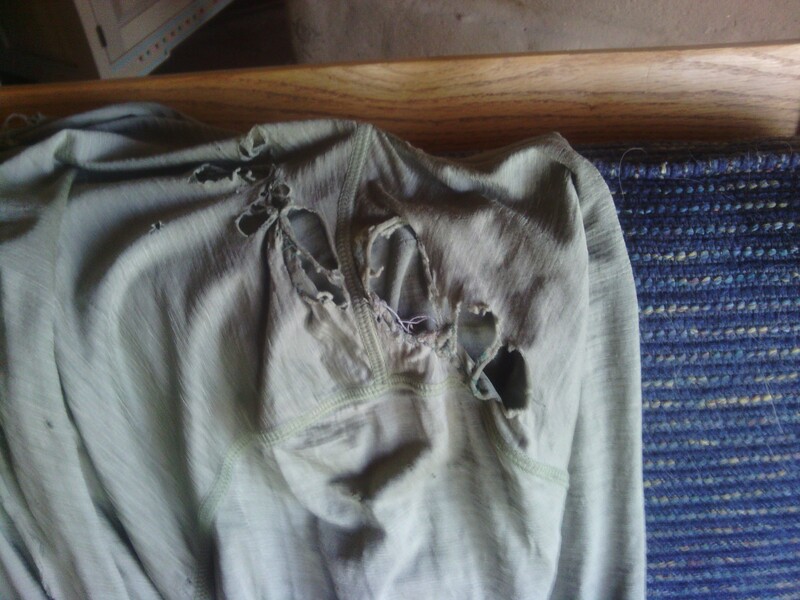 The RailRiders performed well, did not bind at the knees, and allowed ventilation with the side zippered mesh.